Both of these charts represent my still-dim comprehension of the concept, and if someone else has better charts or corrections to add, please share! 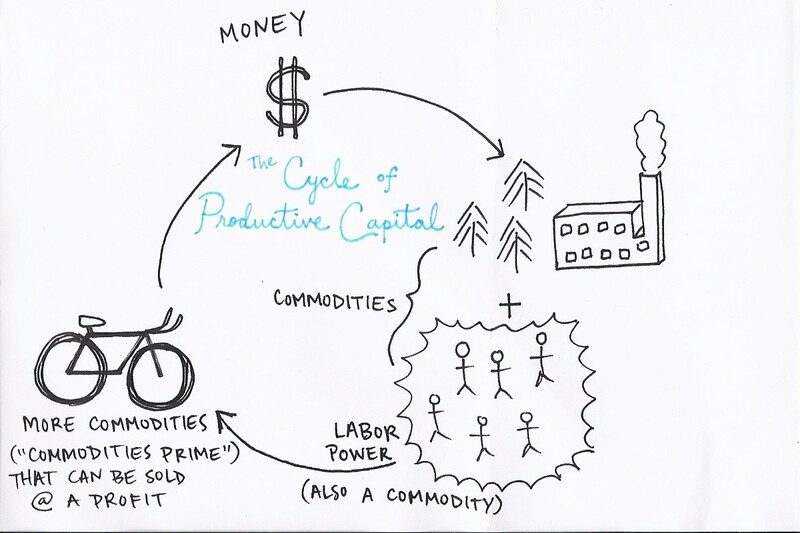 Minimally, this illustration should probably be in the shape of a spiral to show how M'>M, and the extra (profit) gets re-invested? I dunno. Now we see some often-invisible stuff start to appear. Historically, huge influxes of money in capitalism come from stealing land, enslaving or exterminating people, or putting them into debt on purpose so their wealth can be taken "legally." So there's one invisible dynamic. Dead labor means that the maquiladora didn't just grow there on its own like a tree, but required the exploitation of people in order to be built. Finally, we see the reproductive labor that is necessary to reproduce labor power, but which is often rendered invisible as a "personal service" via enforced gender roles, nuclear family, etc. Til then, take care, friends! these are tight drawings. i was talking to ryan about it earlier. reproductive labor prolly goes into fixing up the old dead labor as it breaks down too. 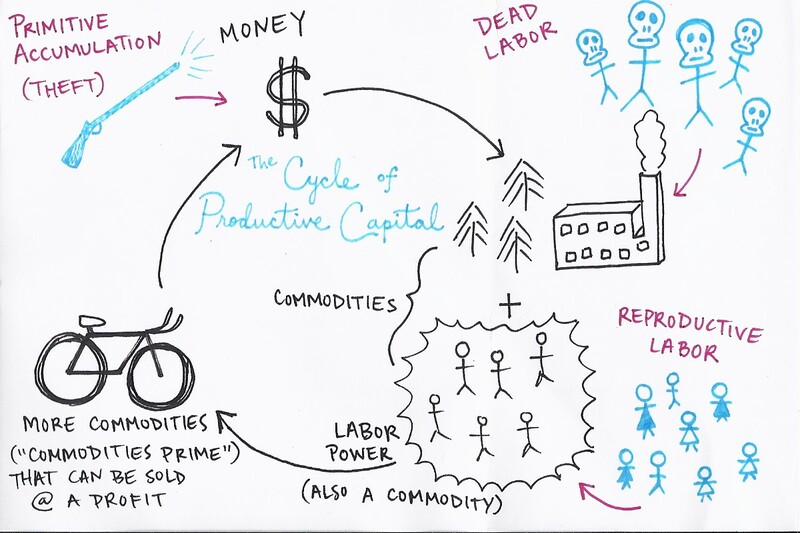 looking forward to more marxist drawings! and thanks for the insight abt reproducing the old dead labor, but can you explain a little more? when i imagine fixing up / maintaining a run-down factory, for instance, i imagine people getting paid wages to do that work, like in any other service commodity. which seems different from reproductive labor?